The temperatures have been in the 40's the past three days. But we are scheduled to have some more winter weather this week. I picked more brussels sprouts after our walk this afternoon. They will probablly be served in this evenings mac and cheese. Sunday was a quiet day. I finished reading "Zeitoun" by Dave Eggers about one families experiences before, during and after Katrina. Very interesting and alittle heavy. 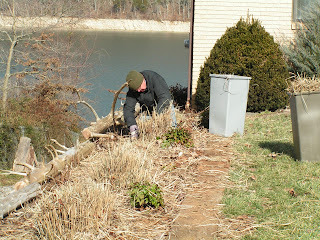 We also trimmed the fountain grass so we would have some more fire started for the wood stove.